I came across this scene walking through Old Havana. I don’t believe this gentleman was an official barber but he seemed to be doing a good job. This entry was posted on February 9, 2015 by edithlevyphotography. 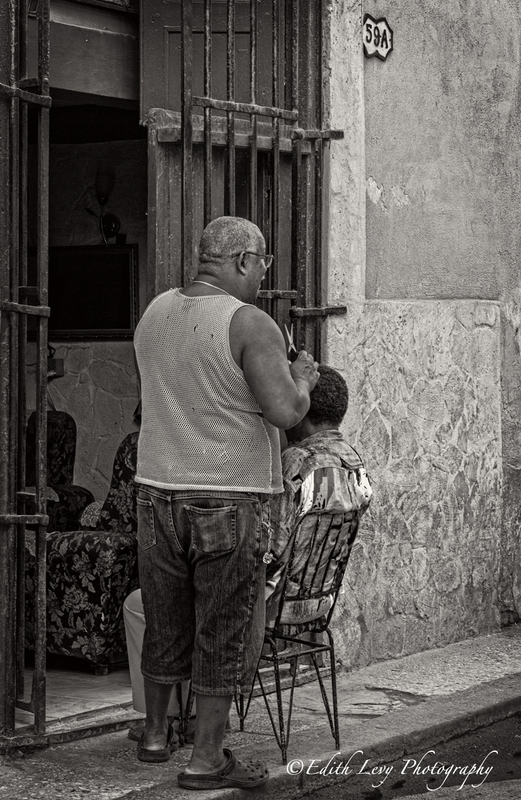 It was filed under Black & White, Cuba, Street Photography, Travel and was tagged with 7D, barber, black and white, Canon, Cuba, haircut, Havana, monochrome, street photography, travel photography. Hello Edith, a barber outside, that’s unusual, we don’t see that every day. 😉 Cool shot! This morning, your blog has taken me from Nashville and all it’s color and flash, to Havana in monochrome, with all the detail and texture. Nice contrasts! Such a typical Cuba scene. Anne Jutras says it’s not often we see this, but in Cuba it certainly is. A lovely street capture, Edith. Thank you very much Otto. I just loved Cuba and the people I met. I must get back there. Thanks Mike. I think he was just giving a fiend a haircut. I didn’t see clearly in the building but it looked more like a private home.